To anyone reading this, I apologize that this site hasn't been updated in so long. Life gets in the way, etc. This blog will remain on indefinite hiatus as of now. To clarify, this site is NOT affiliated with Mr. Newman in any professional way, nor does Mr. Newman read (to my knowledge) any posts, comments or questions posted here. I'm sorry that I have not been able to answer any of these specific inquiries. Thanks for visiting, and, again, my apologies. 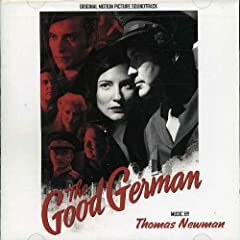 THE GOOD GERMAN now on iTunes! An early Christmas present for Thomas Newman fans! iTunes has THE GOOD GERMAN's score available for sampling and purchasing. Amazon lists the CD release date as January 9th. Amazon also lists the LITTLE CHILDREN CD for January 23rd. Update: The mystery continues... The GOOD GERMAN score has been taken off iTunes. Ironically, the CD is out and on sale at Amazon.com, but they've confused the cover with The Good Shepherd. If I can't find it in stores soon, I'll be ordering one myself; I just saw the film and the score is just fantastic. GOOD GERMAN score preview in the new FSM podcast! Here's something to start your day off just right: The new Film Score Monthly podcast features, believe it or not, a preview of Newman's THE GOOD GERMAN score (as well as a few other upcoming scores). As the hosts say, people have been waiting a long time for Newman to be forced to do this kind of a score, and it sounds like they won't be disappointed! Just search for "Film Score Monthly" in your iTunes Music Store and download the latest episode, or download it directly at this link. I've just become a new fanboy of this podcast, that's for sure. "It can be a great time for film music. Does it turn out that way? Not all the time, because there are so many people -- middle-management people -- with agendas that can make things more difficult. I'm so grateful to just be in a room with great players and hang with them, and have lunch with them. Any time is potentially a great time. Yes, you may be shot down, and things may be awful, but things can also be potentially fantastic." Read the rest, in which Newman reveals some frustration about LITTLE CHILDREN being released only digitally, here. The question is will we see an iTunes release before this? I'm excited for this one folks, and I think it could easily overshadow LITTLE CHILDREN as Newman's Oscar-hopeful. I normally won't be doing this kind of thing, but I just wanted to let any readers here know that I've just launched my personal blog for movie reviews. You can get to know a little more about me and some great new movies by visiting samsmyth.blogspot.com. Bookmark me, leave me some feedback, and stay tuned for more. Good news, UK fans: Silva Screen Records has announced that they will be releasing the LITTLE CHILDREN CD soundtrack in the UK on December 11th. Read the news item on their official site. For the US, I'm still hearing January, but I'm enjoying my iTunes copy just fine. Created and run by Sam Smith. Email news, rumors, and feedback to apocalypsemyth@yahoo.com. This blog was created by Sam Smith in October 2006. Email him at apocalypsemyth@ yahoo.com.